Societies make decisions and take actions that profoundly impact the distribution of health. Why and how should collective choices be made, and policies implemented, to address health inequalities under conditions of resource scarcity? How should societies conceptualize and measure health disparities, and determine whether they've been adequately addressed? Who is responsible for various aspects of this important social problem? 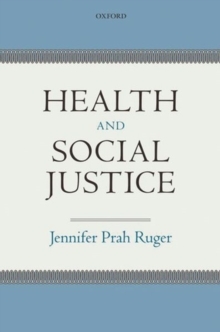 In Health and Social Justice,Jennifer Prah Ruger elucidates principles to guide these decisions, the evidence that should inform them, and the policies necessary to build equitable and efficient health systems world-wide. This book weaves together original insights and disparate constructs to produce a foundational new theory, thehealth capability paradigm. Ruger's theory takes the ongoing debates about the theoretical underpinnings of national health disparities and systems in striking new directions. It shows the limitations of existing approaches (utilitarian, libertarian, Rawlsian, communitarian), and effectively balances a consequentialist focus on health outcomes and costs with a proceduralist respect for individuals' health agency. Through what Ruger calls shared health governance, it emphasizes responsibility and choice. It allows broader assessment of injustices, including attributes and conditions affecting individuals' "human flourishing," as well as societal structures within which resource distribution occurs. Addressing complex issues at the intersection of philosophy, economics, and politics in health, this fresh perspectivebridges the divide between the collective and the individual, between personal freedom and social welfare, equality and efficiency, and science and economics.